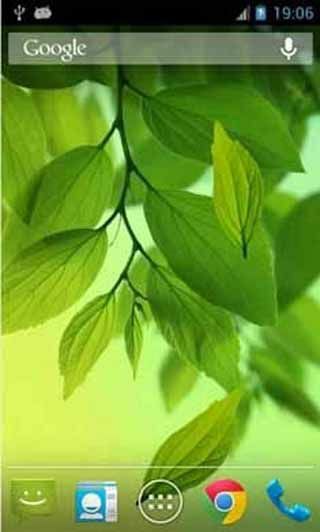 Free download Leaf Live Wallpaper (formally Galaxy S4 Leaf Live Wallpaper) for android. It will give your android device a realistic touch of nature after installing and setting it as wallpaper. Mobiles or we can say the android background wallpapers increase the beauty of your device if they are amazing in effects. Galaxy S4 Leaf Live Wallpaper is very easy to download and install it to your android device. It is not required Samsung Galaxy S4 device as its name states but you can install it on any android base device such as HTC, Xperia, Nexus, QMobile or any other brand’s. Galaxy S4 Leaf Live Wallpaper will show you still some leaves. The very amazing thing is that you will see some floating leaves on your mobile screen. But this is not enough; try to tap your mobile and you will come to know about the water effect. It looks like that you have touched the water surface and the floating leaves are at the surface of this neat and clean water. When you tap the screen and the leaves are wondering just near then you will see the leaves moving backward along with the waves produced by your tap. This effect will really amaze you. You can easily install and apply this great wallpaper on your phone wallpaper through Google Play. After installing the wallpaper, you will see it along with your installed wallpaper. This is basically an application so it has some setting options too. As it is a free application so it supports some ads which will display at the top of your screen only when you open the application. You are asked more free apps but you can skip it.